Crafting a summer reading list is easy. Sticking to it is a bit more challenging. One finds themselves gravitating back toward familiar parts of their bookcase. Revisiting one such shelf, a well worn text is read once more: The Sporty Game by John Newhouse is the definitive book on the airliner business. Newhouse died in 2016 at the age of 87. Published in 1982, Newhouse’s anecdotes and lessons are as relevant, prescient and familiar as ever 36 years later. Far ahead of its time, The Sporty Game captured nearly all the trends we see in the aviation today: The tug of war for Britain on whether it would follow Europe or the U.S. for its industrial future, the rise of the importance of carriers in Asia-Pacific, and the threat of a distant new patient, well-funded entrant – then Japan. The familiar modern lines of 1982’s aviation trends are too numerous to list. Crafted in the years following deregulation, the U.S. airline business was a mess as it tried to understand the competitive landscape after decades of Civil Aeronautics Board shepherding. From the collection of Tom Harris. You could read Newhouse’s deep exploration of economic and political forces driving the business of flying and be forgiven if you thought it was written today — with the exception of a few changed characters and aircraft designations. “The hole in the market,” according to a Boeing sales executive “was right there—halfway between the 727 and the L-1011” or roughly 200 seats, wrote Newhouse. It was the middle of the market of its day. At the time, the debate inside of McDonnell Douglas was a precursor to a familiar one we see again in 2018 as Boeing weighs the business case for its own New Middle-Market Airplane (potentially the 797) against a squeeze by a notional Airbus A321XLR. “Boeing’s 757, slightly smaller and narrower than the 767 discouraged McDonnell Douglas from building the DC-11, even though three of the major airlines-Delta, United and American-had encouraged the company to build it, in part because they wanted competition for its own sake, in part because they were not particularly attracted to the 757 itself. 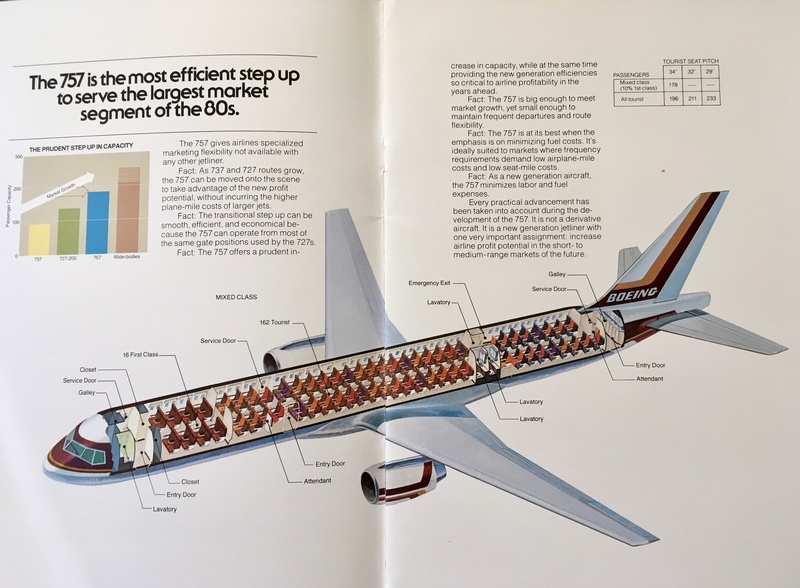 As conceived, the DC-11 was a double-aisle airplane and hence more comfortable than the longer, single-aisle 757; although the intended seating capacity was about the same for both, the DC-11 was supposed to have lower operating costs than the 757 because of certain performance advantages and, overall, a more modem design. 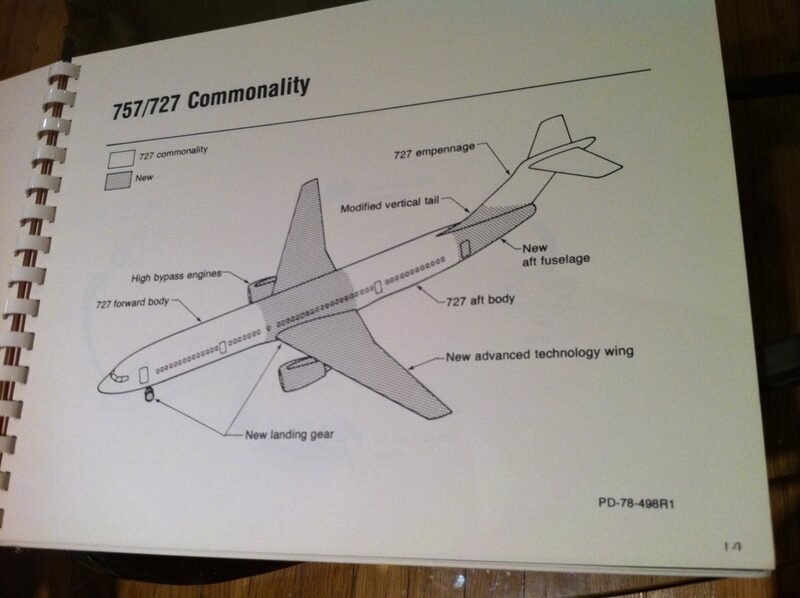 A September 1978 Boeing brochure highlighting the features of the 757 and its commonality with the 727. From the collection of Tom Harris. Even the verbiage of The Sporty Game is alive and well four decades later, as Boeing tries to replace the 757 and 767 in a single airplane. Back in Seattle in the late 1970s, Boeing was pushing ahead with twin airplane designs. The X stood for experimental. T. Wilson (then-Boeing’s top executive) said: “The design boys wanted a specific number. I said no. A number would imply we know what the hell we’re doing to build and we don’t. So the 7X7 is whatever we’re going to do next.” Boeing has learned caution, if not humility, from its 747 experience. It was unwilling to settle on a design before the market was clearly ready for it. But of the great risk — betting the company on an all new airliner — was the very heart of the sporty game. “Companies that tempt fate by failing to plan seriously for the unknowns may pay dearly for their rashness,” Newhouse wrote. Everything and nothing has changed.